Quirky, the GE-partnered online inventors’ community, today introduced a number of new additions in its connected home line of products. One of the most interesting of these is Norm, the company’s first stab at creating a smart home thermostat. It goes a step beyond the popular Nest thermostat by offering smart home sensing – the Norm can adjust heating settings based solely around the rooms of the home your family regularly inhabits. 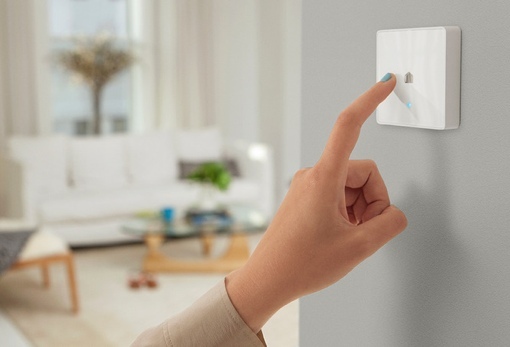 The core $80 Norm device is a simple-looking wall mounted box that hardwires to your HVAC system as a thermostat replacement and connects to your home Wi-Fi network. Norm will learn your heating and cooling preferences to automatically set schedules for you. Like the Honeywell Lyric, the Norm uses phone-based geofencing to know when you’re home, when you’re not and when you’re on your way back. It also tracks your usage, so you can make more sense of and save money on your home energy bills. The thermostat can be linked with other Quirky devices around the home with temperature sensing properties, like the $49.99 Spotter sensor. This will allow you to set your thermostat’s operation around the rooms of the house you actually use. Norm can turn on your furnace when the temperature drops below a certain level in your bedroom at night, for example, as opposed to solely monitoring the temperature immediately around the Norm. My main quibble with the Norm thermostat is the lack of a temperature display on the device. You can still perform some fine-tuning of the heat by tapping the faceplate to increase or decrease the temperature setting, but if you want precision, you’ll need to use a smartphone or the expensive $300 wall-mounted Quirky Wink Relay. That makes it hard for technophobes – or just people without smartphones – to use. Also note that you'll need to connect the Norm to a $50 Wink HUB to get it to work as advertised. There are a number of other interesting items also introduced by Quirky, including the $40 Tripper smart window and door sensor, the $35 Overflow water leakage detector, the $50 Outlink smart outlet, $60 Tapt smart wall switch and the $100 Ascend smart garage door opener. All of these can be controlled through the Wink app or through the aforementioned $300 Wink Relay. They’re all good choices for someone trying to keep all their connected home devices under a single brand. Remember, though, that you don’t need to stay brand loyal when building your connected home – programs like Apple’s coming HomeKit are designed to bring mix-matched systems together so they can communicate with each other. The $80 Quirky Norm is scheduled to start shipping on December 21, 2014. You can learn more about the device or place your pre-order by visiting Quirky.com. Hello. I’m the inventor of Spotter and Norm. Just to clarify. The co-branded Quirky+GE products mention in your article run on a platform called WINK which utilizes a the WINK. The WINK ecosystem works with some of the most trusted brands in this space including Leviton, Schlage, GE, and even Nest. The inspiration to the WINK platform is that the consumer can mix and match their brands. This is achieved via the WINK hub or Relay Switch which will allow the different radio refrequencies for these products to all work in the WINK ecosystem. For more info, check out www.wink.com. I hope that clarifies things. Thanks for the article. Cheers.